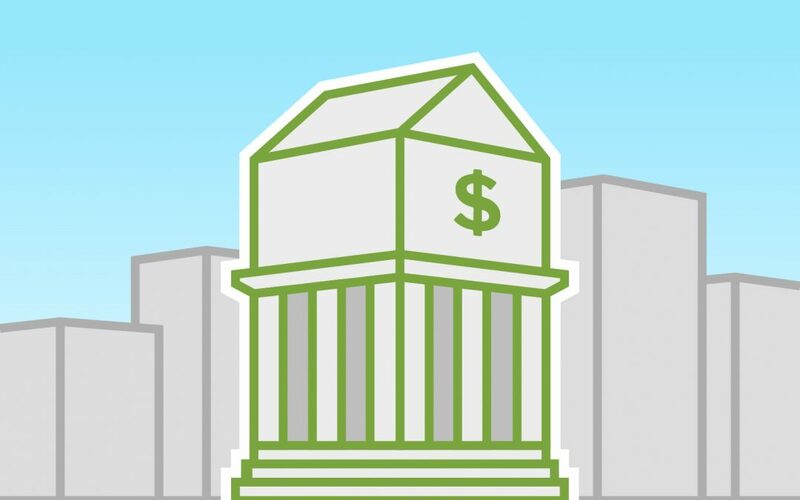 Financial tech startups are shaking up the way consumers think about money, and the titans of finance are taking notice. Ellevest helps professional women invest in ways that account for (and fight back against) financial inequality. Stash helps low-income millennials understand how money works. Wealthfront is stripping out human error and bias from the investing equation with a software-only investment approach. The most successful of these startups have made significant investments in content marketing—blogging, email newsletters, podcasts, and other varieties of Free Helpful Stuff. So … what are the incumbents doing about it? Let’s take a look at how the old guard does content marketing, starting with Charles Schwab. Charles Schwab is a traditional bank and brokerage firm—one of the largest in the United States. They boast more than $3.36 trillion assets under management as of 2017. Let’s take a look at what Charles Schwab is doing well in terms of content—and what they could be doing better. Charles Schwab has more than 1,200 content marketing pieces, so I’m going to keep this rather high-level. Before I get into the content itself, let’s frame some of the strengths and weaknesses of this content universe as a whole. Schwab isn’t sitting on a mere mountain of content—they’re sitting on the Himalayas of content. I’ve counted more than 1,500 content marketing URLs in making this teardown, and this isn’t even touching their B2B sites! Everyone knows about Charles Schwab—they’re one of the largest institutions of their kind in the States. And when Schwab publishes content, it comes from an authoritative source. They attribute much of their educational content to their panel of high-profile experts. The sheer brand authority that Schwab wields in this industry is staggering. Schwab has about 17,600 full-time employees. So even though only about two dozen LinkedIn users have content strategy– or content marketing–related job titles, there’s no shortage of minds they can tap for content ideas. And with so many advisors on staff, and with such a strong brand, Schwab has a built-in content distribution network. You’ll see that direct traffic is by far their biggest traffic source. You’ll also see that they even leverage their homepage to promote content in ways that almost any consumer company should emulate. They’re huge, and so is their pocketbook. (Schwab spends more than $230,000 per month on SEM ads alone!) Challenger startups cannot outspend Schwab—which means Schwab can drive up cost-per-click, hire talented content writers, and run more expensive brand-awareness campaigns. As you’ll see, despite having all this content, Schwab isn’t the SEO heavyweight you might think. Subdomains, stilted URL structures, and thin content tend to be the norm here. Charles Schwab has plenty of content to keep their leads and financial advisors engaged. But the whole system could be restructured to give users better next steps—and to push more users to Intelligent Portfolios. Even simple fixes like adding the Facebook pixel to these properties or optimizing their calls to action could be a boon to Schwab. Bottom line: you’re going to see that Schwab does a lot of things well—maybe better than anyone else. But you’ll also see how easy it is for companies with much smaller content marketing teams and budgets to outmaneuver the trillion-dollar behemoth. 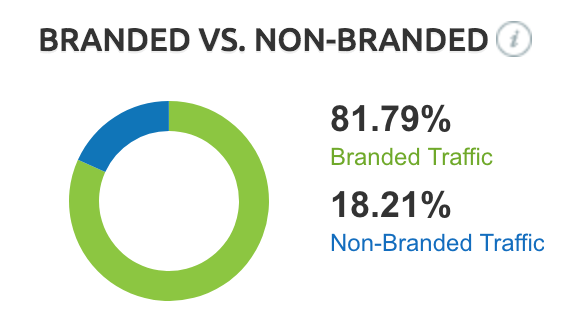 It’s a massive amount of content marketing—I’ve analyzed more than 1,500 URLs. On one hand, they have a ton of great content. On the other, there’s almost too much to feel like you can successfully navigate it. Schwab knows they’re just part of the bigger story—yours. You can tell this by the way content is arranged on these sites. Schwab makes it relatively easy to filter their content based on what you want to do. Schwab clients probably want to consume content that helps them accomplish certain financial goals. They probably aren’t trying to develop encyclopedic knowledge on bonds or ETFs. There’s such a dizzying amount of topics and categories on Schwab’s properties that it would be nearly impossible for people to navigate by category alone. The smallest Schwab property I analyzed was their robo-advisor blog—a “mere” 118 articles. Those articles are spread across eighteen topics. They range from taxes to markets to fixed income—and this is just the small site. The gigantic Insights blog on Schwab.com? That has articles occupying more than 70 categories. But aside from this, the topic sprawl is a thing to behold. I tried to screenshot the number of topics and subtopics that appeared on Schwab’s other properties, but they didn’t fully capture just what kind of drop-down Tartarus users find themselves in. It’s kind of like the first time I went to the Cheesecake Factory—I needed 30 minutes to browse the menu just to get a feel for what my options were. Not necessarily. But if you’re going to have a ton of topics available, consider giving your readers ways to more quickly understand the breadth of topics available to them. If Schwab only had one definitive article on each topic, that would be another story entirely. But they don’t. We’re talking about hundreds of articles across multiple properties. When you have that much material on hand, it makes sense to treat your content library more like, well, a library. This seems to be the direction Schwab is heading in by categorizing their content by life event. But there’s still a long way to go here when it comes to giving people an easy navigation experience. If I were Schwab, I’d take a few notes from NerdWallet, Betterment, and The Motley Fool when it comes to arranging content topics in a way that people can easily navigate. Now that we know what kind of content Schwab provides, let’s take a look at each one of these properties to see what kind of traffic they’re getting, and how they’re getting it. Let’s tackle the big dog first. The resource center on Schwab.com is enormous (especially if you include the arm of insights for traders). Ahrefs counts more than 1,200 URLs in this section of the site alone. Let’s get an idea of what they publish here, what kind of traffic they’re getting, and what content is winning that traffic. Like I mentioned above, I’ve counted more than 70 categories on Insights. Delving into them all probably won’t be helpful here. Suffice it to say that they’ve covered most of the angles when it comes to investing. But looking at the format and publishing frequency can give us an idea of where they’ve made investments (and where some of their content focuses may be shifting). Schwab groups their content around five basic formats. I’ve listed those here, along with the number of pieces that fall under each as of May 17, 2018. They’re continuing to pump out more and more content, folks. For example, at the beginning of the year they launched the podcast Choiceology. 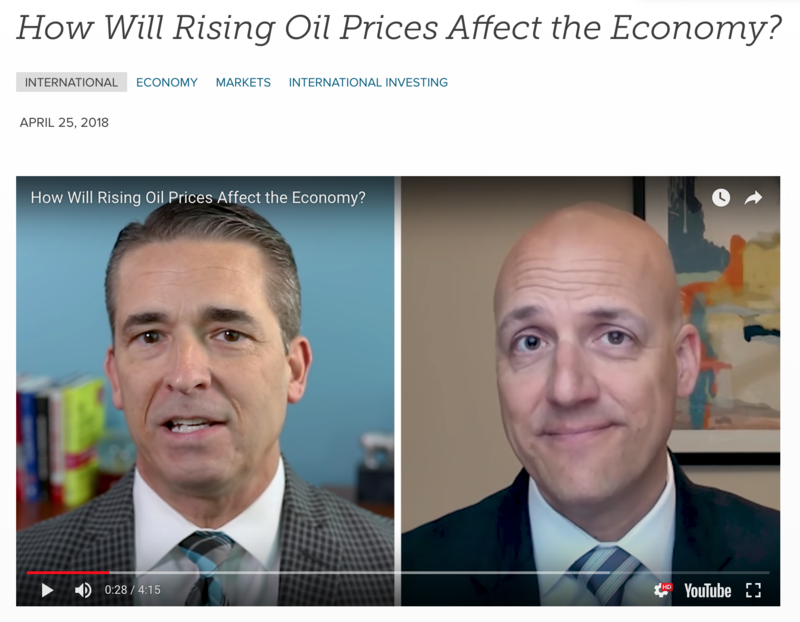 Most of their recent videos feature Schwab experts discussing and explaining how the market works and what investors should keep in mind as things change. 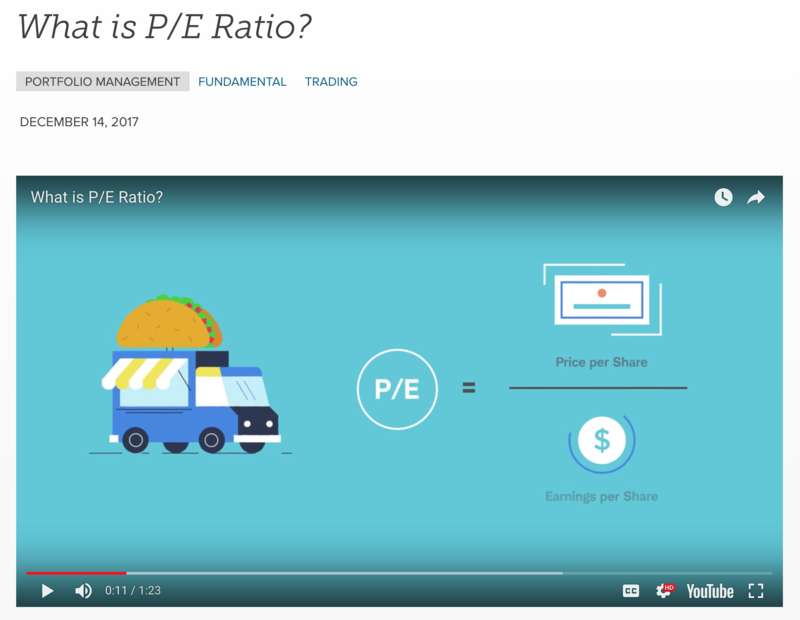 They’ve also invested in animated videos explaining various investment-related terms and concepts. Insights is a content factory. No, Insights is a content supernova. 35 new pieces published in April 2018. That’s a little more than one post per day this year. Again, they make heavy use of their panel of high-ranking experts. Any time something happens in the markets, a Schwab expert has something to share about it. Length isn’t everything when it comes to SEO, but comprehensive content does tend to catch a good deal of traffic from search, and the more valuable information a page has, the more likely it is to gain links. Note: Of the six Insights blog posts that are longer than 4,000 words, five are podcast transcripts. 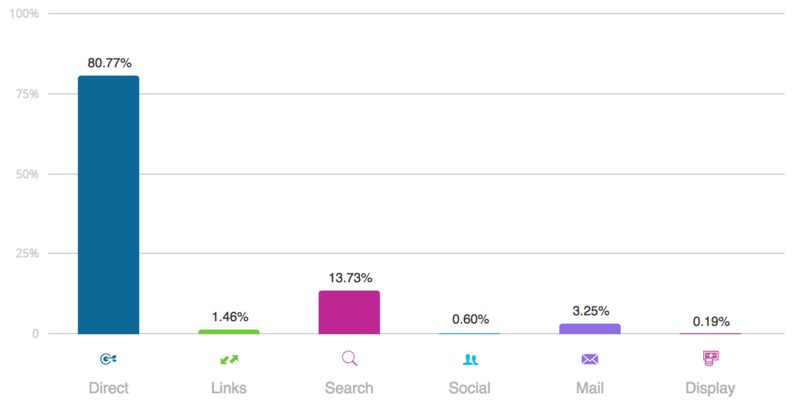 Where does Charles Schwab Insights get their traffic? Traffic to Schwab.com is mostly direct. That is, most of their traffic comes from people bypassing Google and typing “schwab.com” into their browser. This makes sense: most people go to Schwab.com to check up on their existing accounts. So what about the almost 14% of traffic coming from search? According to SEMrush, about 80% of that traffic is branded search, meaning that most of their visits from search are simply people Googling something with “Schwab” (or various misspellings thereof) in the query. It’s basically treating Google like your browser’s address bar. So take all that into consideration, and you have about 3.25% of traffic to Schwab.com coming from their email marketing, and about 2.7% of that traffic coming from non-branded search. But don’t let that miniscule percentage fool you: Schwab’s resource center still gets almost 67,000 organic visits every month. We’ll dig into that in a bit. Suffice it to say the Charles Schwab brand is driving most of their traffic. What content gets organic search traffic? Although Insights boasts hundreds of resources, the top 26 posts pull in 60% of the organic search traffic. In other words, in matters of search, 2% of the content is doing 60% of the work. Other examples include their explainer articles on margin (3% of organic traffic) and 2018 tax reform (4%). Which posts are people sharing? The average Schwab post is shared about 80 times on social media, according to BuzzSumo. That means on average, their blog posts outperformed about 90% of posts on the Web in 2017. You can see that there’s some seasonality to these posts, and that the top-performing ones tend to focus on personal finance and taxation. The MoneyWise financial education site is a standalone resource for helping people make their dreams reality by better understanding their finances. It’s far smaller than Insights—about 300 pages. The website also has sections dedicated to personal finance tools, as well as a Q&A section with Carrie Schwab-Pomerantz. BuzzSumo counts 56 new articles posted or updated in the past year—amounting to a publishing schedule of about once per week. However, the site isn’t arranged to be read as a periodical. Instead, it’s an evergreen library of interconnected resources. Where does MoneyWise get its traffic? This site gets most of its traffic from search. Almost none of this is branded search, so we’re looking at about 25,000 visits a month from people Googling non-Schwab queries. We could explore the commonalities shared by the top 10 pages on MoneyWise, but it wouldn’t be very helpful. More than 80% of the organic traffic on this site is going to just three pages: a guide to calculating your net worth (44%) with its corresponding worksheet (4%), and an interactive monthly budget planner (36%). Feels a little anticlimactic, right? 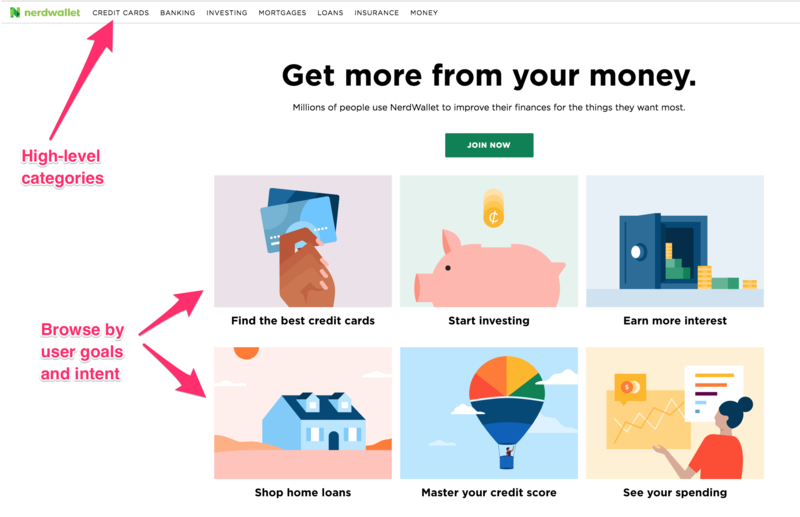 Well, there’s still something to learn here: Even though there are more than 250 pages on this site, most of the traffic is going to tools people can use to apply to their own finances. We’ve looked at the kind of content Schwab makes for the masses. But what are they doing specific to their robo-advisor platform, Intelligent Portfolios? Turns out there’s not a lot to see here. The publishing schedule is sporadic, and it’s a mix of robo-advisor press items, product updates, and expert advice. If I combine the data from Ahrefs and SimilarWeb for this subdomain, we get total traffic somewhere in the 60,000 visits/month zone. About 40% of that traffic is coming directly to the subdomain. Again, that’s to be expected: people are logging in to check up on their portfolios. About a quarter of that traffic comes from referral links—which again makes sense, since robo-advisors are getting a good amount of media attention nowadays. In terms of search traffic, the blog section of this site is only getting about 2,600 organic visits per month. That’s not a great deal—and they’re not getting much traffic from other sources, either. What will (or should) Schwab do? They have a wealth of content, which is something fintech startups can’t always afford. However, the sheer volume is rather overwhelming. Giving people easier ways to navigate all these articles (and all these categories!) would be a huge advantage. Take a spin through Schwab’s content and you’ll find plenty of calls to actions … however, not all of them make sense. Many of these posts direct people to simply visit MoneyWise or learn more by reading more Insights material. For some posts (especially video transcripts), the call to action is simply to go to Schwab.com and then find the resource center! There’s a general call to action that persists across most content: open an account. However, I imagine Schwab will begin determining exactly which kind of account to direct people to open. They have a lot of content that could benefit from more direct ties to more relevant next steps. It would be a big project, but Schwab would really benefit from streamlining those next steps—especially if they funneled more people toward their robo-advisor. Schwab can take inspiration from how fintech startups like Betterment are using quiz-style CTAs to diagnose next steps for their visitors. A similar approach could improve the relevance of the content and services Schwab recommends as a next step. Between Google’s penalties on thin content and Google’s preference for engaging pages, it’s becoming more and more of a no-brainer for large sites to trim content deadweight. Schwab is sitting on gobs of content that nobody’s reading—a good SEO strategy would involve culling some of that. There’s a lot of content on Schwab.com, and so on one hand, I can’t blame them for having long, long, looooooong URL strings. and individual posts are further buried in the /content/ subfolder before you finally hit the individual article’s slug. Schwab has their reasons, I’m sure. But this means most of Schwab’s content is buried several subfolders deep—not a preferable situation when the Google bot comes crawling around. Beyond all this, it wouldn’t hurt for Schwab to clean up their URL slugs on individual pieces of content, either. Right now the slugs are essentially the article titles with stop words like “the” and “a” removed … sometimes. Schwab can identify and combine overlapping pieces of thin content into a piece that’s more in-depth and helpful. One great article on a specific topic will provide a better experience for visitors (and rank better on Google) than 30 thin articles. Schwab has invested heavily in producing exceptional content from exceptional financial minds. There’s a lot of maintenance that could be done to optimize it—and until that happens, challenger brands have a better shot at outmaneuvering them by making content that’s better optimized for search engines and human engagement. Granted, Schwab must have the resources to make this change rather quickly—assuming their internal processes allow them to. Whether you’re a big bank or just a fintech startup, you’ll want to keep an eye on Schwab’s content strategy. They don’t seem to be slowing production anytime soon.